Two principalities, Hohenzollern-Hechingen and Hohenzollern-Sigmaringen, named from the castle of Zollern, in Swabia; formerly sovereign states, but since 1849 incorporated into the kingdom of Prussia. In a total population of 66,783 there are 576 Jews. Whereas in the Middle Ages the Frankish line, that of the Burgrave of Nuremberg, had a great many Jews in its territory, under the house of Swabia, which was divided in the seventeenth century into Hohenzollern-Hechingen and Hohenzollern-Sigmaringen, they were found only in isolated cases. In 1701 Prince Frederick William I. (1671-1732) took six Jewish families under his protection, and later gave them a burying-ground "near the gallows." His successor, Frederick Ludwig (1732-1750) was tolerant toward the Jews; but Joseph William (1750-1798), at the wish of his bride, Princess Marie of Spain, proposed to drive them out. This measure, however, was prevented by the sudden death of the princess. The Jews then, through letters of protection, received permission at various times to settle in Hohenzollern; and in 1754 for the first time a small Jewish colony was formed in the Friedrichstrasse of Hechingen. The Jewish community of that town was organized in the following year. The condition of the Jews soon improved through the influence of Frau Kaulla, daughter of President Raphael of Buchau who had removed to Hechingen from Haigerloch in 1754, and through the efforts of her brother and her son-in-law, Jacob Kaulla, who induced Prince Hermann Frederick Otto (1798-1810)to treat the Jews kindly. The latter could then settle in the principality without difficulty; so that in 1842 their number had increased to 809. The conditions in Hohenzollern-Sigmaringen were similar to those in Hohenzollern-Hechingen; the Jews suffered there also at first from prejudices and restrictions, which disappeared under liberal princes. 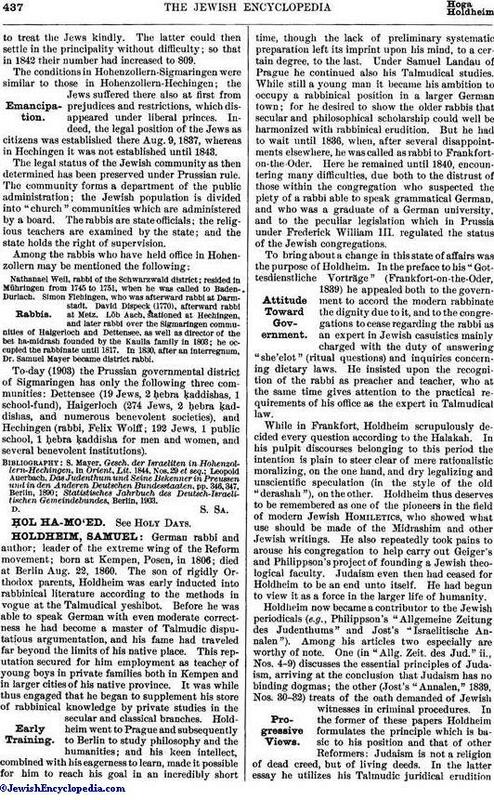 Indeed, the legal position of the Jews as citizens was established there Aug. 9, 1837, whereas in Hechingen it was not established until 1843. The legal status of the Jewish community as then determined has been preserved under Prussian rule. The community forms a department of the public administration; the Jewish population is divided into "church" communities which are administered by a board. The rabbis are state officials; the religious teachers are examined by the state; and the state holds the right of supervision. Nathanael Weil, rabbi of the Schwarzwald district; resided in Mühringen from 1745 to 1751, when he was called to Baden-Durlach. Simon Flehingen, who was afterward rabbi at Darmstadt. David Dispeck (1770), afterward rabbi at Metz. Löb Aach, stationed at Hechingen, and later rabbi over the Sigmaringen communities of Haigerloch and Dettensee, as well as director of the bet ha-midrash founded by the Kaulla family in 1803; he occupied the rabbinate until 1817. In 1830, after an interregnum, Dr. Samuel Mayer became district rabbi. To-day (1903) the Prussian governmental district of Sigmaringen has only the following three communities: Dettensee (19 Jews, 2 ḥebra ḳaddishas, 1 school-fund), Haigerloch (274 Jews, 2 ḥebra. 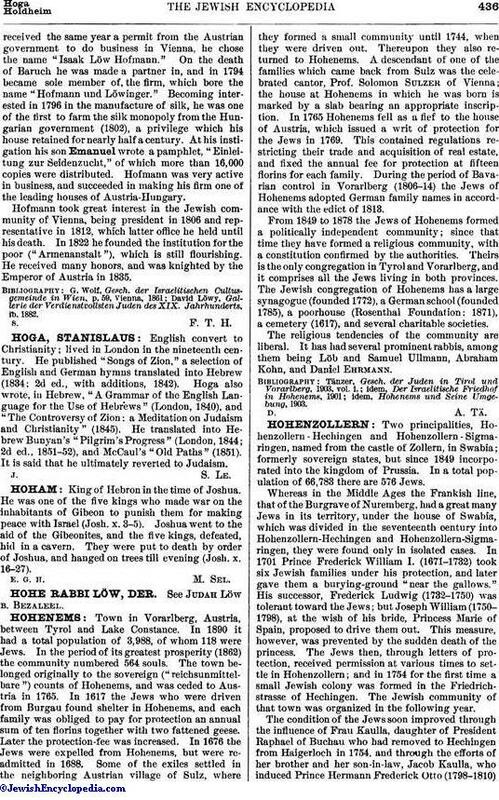 ḳaddishas, and numerous benevolent societies), and Hechingen (rabbi, Felix Wolff; 192 Jews, 1 public school, 1 ḥebra ḳaddisha for men and women, and several benevolent institutions). Statistisches Jahrbuch des Deutsch-Israelitischen Gemeindebundes, Berlin, 1903.